On a visit to the United States last autumn, I decided to go and visit the NRA (National Rifle Association) in Washington D.C., as I knew that the organization had built a museum, The National Firearms Museum, at their headquarters. The NRA is the most powerful lobby in the USA with 4.3 million members. On their website the NRA states that, while no absolute count is available, it is closely estimated that there are 60-65 million gun owners in the United States, 30-35 million of whom own handguns. According to survey research, at least 45% of American households own firearms. At the museum one word came to my mind: fetish, a word that literally means, "something irrationally revered". For a large part of the US population, guns are objects that are irrationally revered. 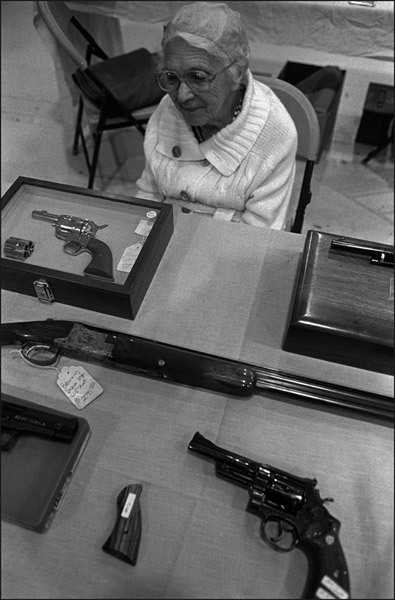 The museum is a place of adoration that proclaims that a gun is equal to freedom. This museum is a “Church of Gun”. The museum contains more than 2,000 guns from the year 1350 to the present. There are guns that have been used in Hollywood movies and that belonged to people like John Wayne or Charlton Heston; there is a policeman’s gun that was found half-melted left from the rubble of the Twin Towers that fell on 9/11; and guns that belonged to US presidents. The museum is divided into galleries. One of these portrays a “typical” boy’s room from the 1950’s. The bedroom is covered with gun motifs and contains a red flannel bed spread with pistol patterns on it, comic books showing rifles, and brown and black toy guns and rifles. There is a gallery devoted to hunting rifles, which honor the guns used by game hunters in Africa. The support for guns is tied to the Second Amendment (Amendment II) of the United States Constitution, which is a part of the United States Bill of Rights that protects the right to keep and bear arms. It states, “A well regulated militia being necessary to the security of a free State, the right of the People to keep and bear arms shall not be infringed”. In the practice of this holy reverence for the gun from the National Rifle Association, the museum, and also in the discourse of right wing politicians and the Christian Far Right, no one talks about the business and moneymaking behind the sale of guns. What, for example, is the yearly profit on guns sold in Mexico to the army, the police, and the cartels? Who are the shareholders? On the web page for the Brady Campaign to Prevent Gun Violence, one of the most active anti-gun groups in the USA, there is an ongoing ticker that keeps track of people shot dead in the United States. For this year the number is 79,898. For today, September 24, 2010 as I write this piece, 89 people have been shot. However, as I wrote this last sentence it rose to 99! An average of 81 people die a day from gunshots and many, many more are wounded. Every few years, the Brady Campaign to Prevent Gun Violence updates the statistics for gun deaths from around the world. For the year 2007 guns murdered 17 people in Finland, 35 in Australia, 39 in England and Wales, 60 in Spain, 194 in Germany, 200 in Canada, and 9,484 in the United States. When I look at the pictures of the Earth taken from space I always expect to see the borderlines of each country cut into the very land. Although the boundaries may not be seen, we know the deep cuts that have slashed our world into pieces and, in our minds, we draw them in. One line I always imagine is that terrain where Mexico and the United States meet. The border's total length is 3,169 km, according to figures given by the US International Boundary and Water Commission and is the most frequently crossed international border in the world. One estimate is that 250 million people cross between these two countries every year. Drugs cross this border. Guns cross this border. In November 2008 one of the largest weapons seizures in Mexican history occurred in a safe house in Reynosa, Tamaulipas. The army found 540 assault rifles, more than 500,000 rounds of ammunition, 14 cartridges of dynamite, 98 fragmentation grenades, 67 bullet-proof vests, seven Barrett .50-caliber sniper rifles and a LAW rocket. The Barrett .50-caliber rifle is an incredibly powerful and accurate military weapon capable of piercing even the heaviest body armor, punching through lightly armored vehicles, and even taking down the rotary-wing aircraft often used by the Mexican government in counter narcotics operations. On the arid borderlands on the United States side of the US/Mexican border there are thousands of gun shops. The estimate is that there are at least 6,600 licensed dealers who are selling guns. The “Church of Gun” also does not have a gallery on the deaths from US guns incurred off of USA soil. There is no “gallery” on Mexico where it is estimated that over 90 percent of the weapons there have been smuggled in from the United States. In Mexico so many guns are confiscated by the Mexican government that they are used as road filler around army barracks. AK47s, pistols, rifle barrels, hook triggers, scopes and crushed magazines are buried beneath the black, oily asphalt: under the jacaranda trees, under the pepper trees, under my feet, the roads are bone yards of past crimes. From the Earth Google website I examine what the USA/ Mexico border looks like from space. One the site I manipulate the photographs and see the countries from the farthest satellite position. I think that Mexico has a strange and beautiful shape like a curled up body lying on one arm. The shape changes as I move in closer and closer until Google Earth allows me to zoom in on Cuidad Juarez. From this his aerial view on my computer, I can see the city blocks, the main square and the cathedral to one side. This is the city where mothers paint crosses on cement light posts in remembrance of their missing or dead daughters. As I move the curser I can actually see the border between Mexico and the United States. I can see the river and bridges. On the Mexican side there many large buildings that I know are warehouses. On the US side I know those rows of roofs tops that look like homes are really thousands of gun shops that line the border, row after row, mile after mile, highway after highway, “from sea to shining sea”. At the “Church of Gun” there was no reference to the massacre of students at the Columbine high school in Colorado when two students killed 12 fellow students and a teacher before killing themselves. There is no reference to the Virginia Tech massacre when Cho Seung-hui killed 32 people and wounded many more at the Virginia Tech College in Blacksburg, Virginia. At the “Church of Gun” there are no galleries devoted to the huge number of women in relationships with a history of domestic violence who have been killed with guns owned by their husbands or lovers. There are no “galleries” to honor all the accidental deaths of children who have access to guns in their homes. The National Firearms Museum also ignores the death of journalists. The Reporters Without Borders’ 2009 Mission Report (on Mexico and the violence against journalists) concludes with the following statement: The press freedom organization is nonetheless convinced that a solution to the tragedy is impossible unless the United States imposes controls on firearms. Mexico’s journalists have to work in a country that practices the most perfect form of censorship: assassination. me gusta la manera que lo podes percibir, como si de verdad hubiera estado en el museo. Interesting Article with a powerful message and ending! But, when will it change! Interesting article with a powerful ending! The numbers in this article seem to be woefully wrong. 81 people a day comes out at 29,000 ish not 79,000. However, any deaths at is regrettable. |2010-12-31 18:37:12 Alfonso - Armas NO!!! Interesante articulo.Es Increíble el endiosamiento de las pistolas en los EE.UU y México es victima de de estos que procuran armas a bandas organizada y a particulares que siega sin compasión la vida de otro. Por la No proliferación de las Arma de Fuego en el mundo. Muy buen artículo pero... QUÉ TIENE QUE VER CON FOTOGRAFÍA?? ?